A lovely, cosy story that made me laugh and cry in turns. A wonderful story of book lovers and life during the war period. I always feel like Perry has a wonderful way of describing the Victorian world and she has a knack for capturing the human psicology and complexities that I find very appealing. There's no one like Elizabeth Chadwick to bring the medieval world to life. Her characters may not always be likeable but they are definitely complex and believable and of course her portrayal of the period is without fault. Sara Donati is a new find for me. I'm very glad I followed Marg's advice and picked this one up because I fell in love with the characters and the setting of America's wild frontier and I can't wait to pick up the next one. 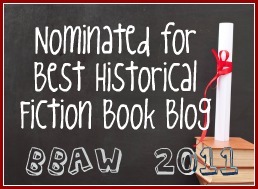 I hope 2010 will prove to be an even better year in terms of Historical fiction! Love hearing your recommendations Ana! Going to add some to my list! Interesting that we both had The Dark Rose in our honourable mentions list. Guernsey was one of my favourites from last year. I finally have a copy of The Guernsey Literary and Potato Piel Pie Society, now I have to make time to read it. I really enjoyed Into the Wilderness, too, and I'm going to read the next two in the series for the Royal Reviews Historical Fiction Challenge. I wish more of Elizabeth Chadwick's books were available in the U.S.!